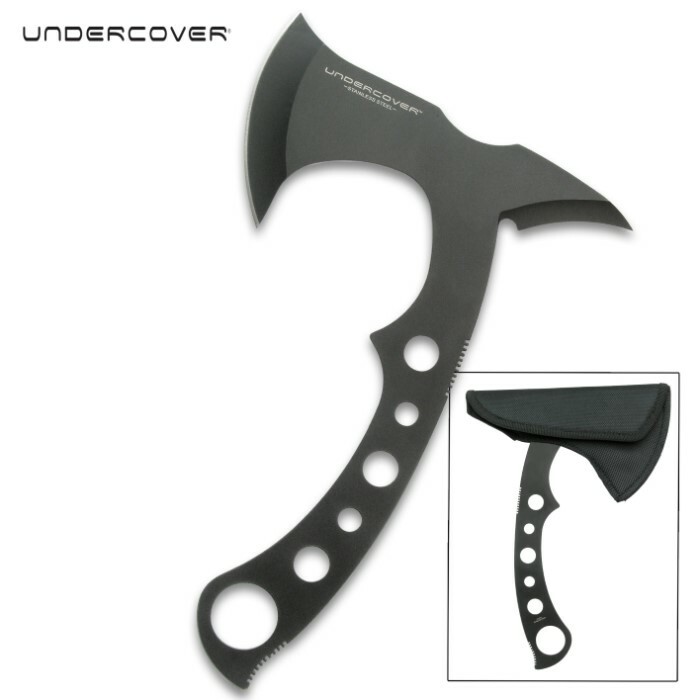 Undercover Throwing Axe - 3Cr13 Stainless Steel Construction, Lightweight Design, PVC Sheath With Nylon Liner - Length 10 1/4” | BUDK.com - Knives & Swords At The Lowest Prices! 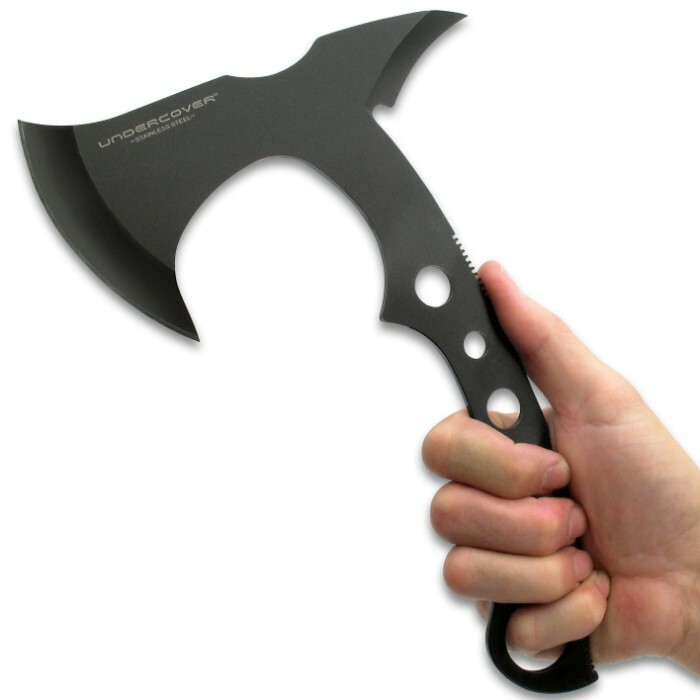 Compact and lightweight, our Undercover Throwing Axe is comfortable and easy to throw, offering exceptional target-penetrating performance. The throwing axe has a solid, 3Cr13 stainless steel construction with a black satin finish and a 6 7/8” axe head with a razor-sharp edge on one side and a piercing point on the other side. 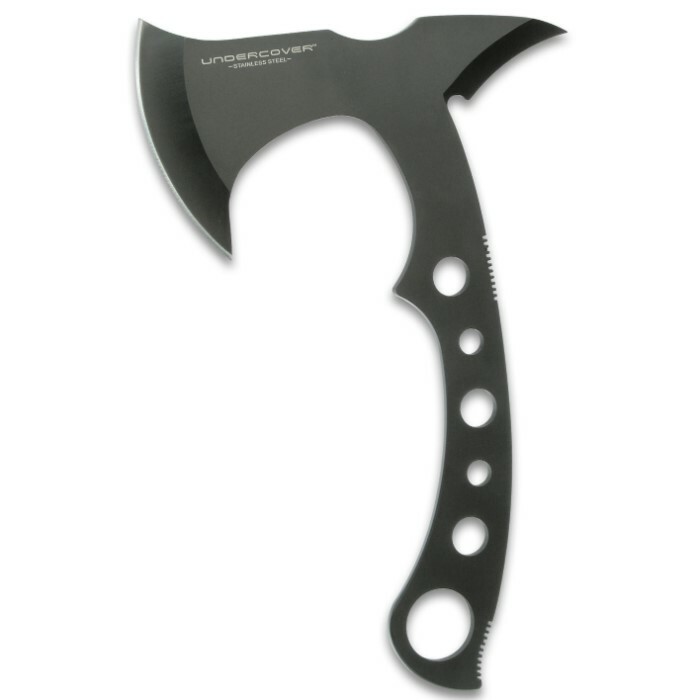 The handle has a comfortably curved design with gripping ridges, which fits perfectly in your hand, and thru-holes reduce the overall weight of the axe. 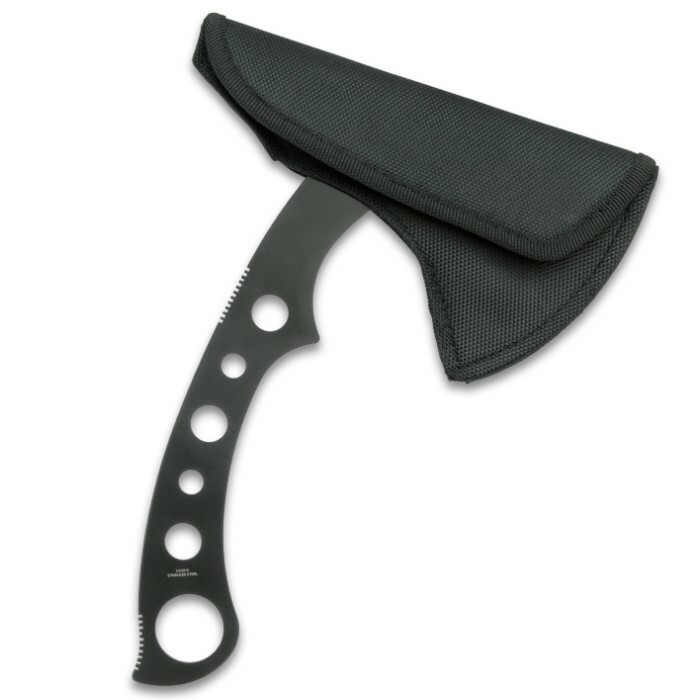 A PVC reinforced nylon belt sheath with a 1000 Denier nylon liner protects the axe head and offers a convenient belt carry option. Firstly, I purchased this little guy last week along with the United Combat Commander Gladius and they came very quickly, so props to BudK for the speedy delivery! Upon opening my new box of goodies, my eyes immediately gazed towards the Undercover box that the hawk comes in, (which is really nice for a box) and I took it out, held it in my hand and realized I was falling in love! The sheath isn't anything to talk about but it does it's job and has a very tight, normal sized belt loop. The hawk itself is black, not gunmetal grey as it appears on the site. 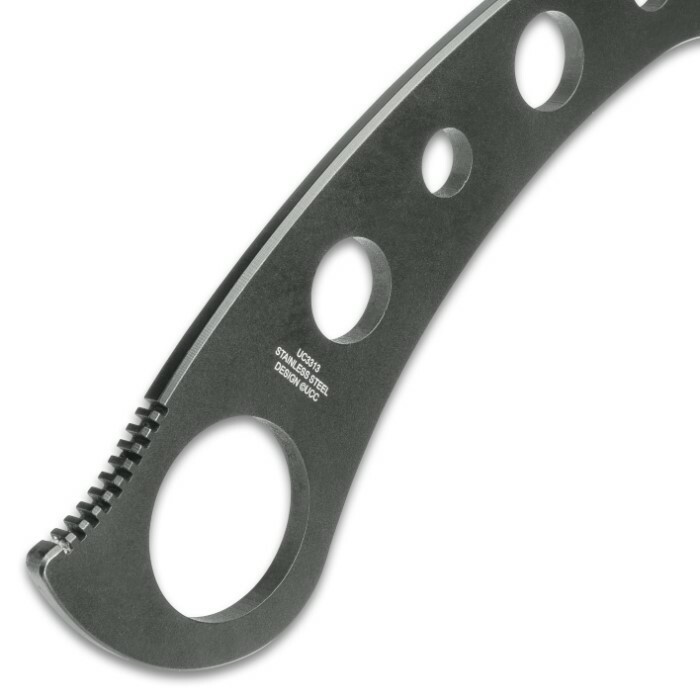 The handle is a bit on the thin side and has the potential to create hot spots depending on how it's used. I fixed that by wrapping it with Paracord. Now it's a beast! 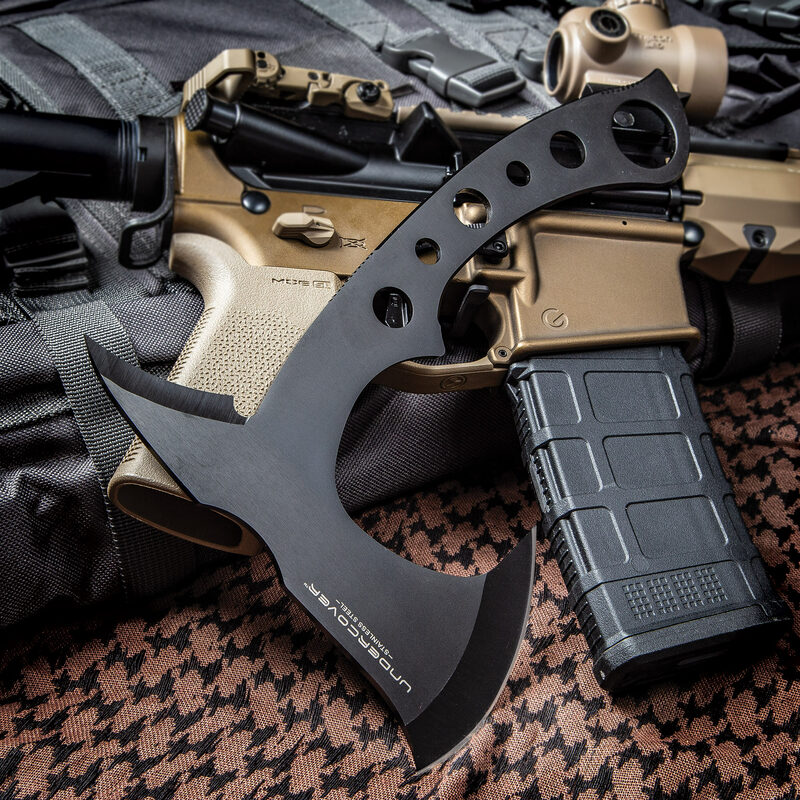 It throws great every time and is also an excellent CQB tool! Carry it close to the chest for weapon retention and quick draws!! I'm not gonna beat the hell out of it but I might see how it handles with breaching applications. I'll update the review soon!